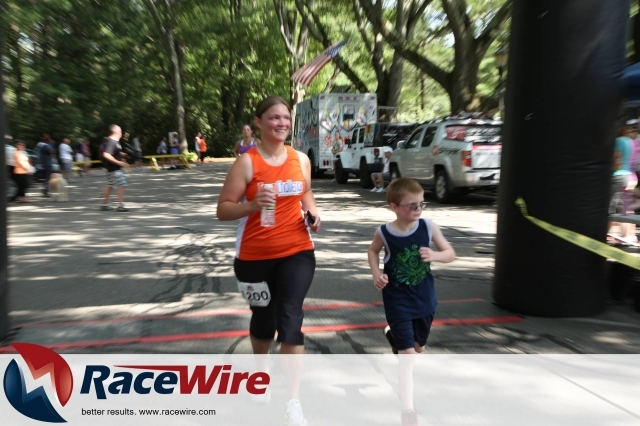 Hey everybody, I just wanted to give a quick recap of the inaugural Narragansett Summer Running Festival run this past Sunday 7/21/2013 at Stonehill College in Easton, Massachusetts. The race included a 5K, 10K & Half-Marathon and was organized by Jason Pagganelli. We owe Jason many thanks as he made Team Intestinal Fortitude the official race charity which was very cool. We ended up having 12 people fundraise (fundraising minimums of $200, $350, and $500 for 5K, 10K and half, respectively) and race for TIF, which I will get to the specifics in a moment. Team Intestinal Fortitude's race morning started very early as committee members Carol Lang, Brian Teague, Brenda Contois, and Kristen Brabants were all at Stonehill by 6am to set up our team's tent. There was also a Team Challenge tent located directly next to ours so CCFA was well-represented. Race members began arriving shortly thereafter as the races were set to go off at 8:30AM. All week leading up to the race was a heat wave throughout the south shore area but it was supposed to cool off by Sunday morning. Unfortunately, that wasn't the case as it was already in the 80's by the start of the races. Pagganelli had mentioned earlier in the week to the Brockton Enterprise that "It's a day to have fun and enjoy the beauty of the course, not a day to run your fastest half marathon." For 5K and 10K runners, this is definitely an opportunity to enjoy the scenic Stonehill College, which is perennially ranked in the top 10 for "Most beautiful campus" by USNews. Also, the half-marathon runners had the opportunity to enjoy Sheep Pasture and Long Pond which are nice areas in Easton. TIF's only half-marathon competitor, Jenny Rand, mentioned the course sported a lot of hills but was well-covered by shade. In contrast, the 5K/10K appeared to be slightly less hilly but didn't appear to have as much coverage from the shade and consisted of a lot of turns. Overall, for a first year event and the first not one, but three that Pagganelli has organized, he did an excellent job in a sold out event.